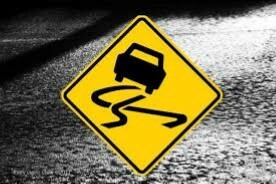 NEWHALL – For the second day in a row, a road in the Newhall area was closed as a precaution because of black ice, a condition that causes vehicles to slide out of control unexpectedly. The black ice was reported about 4:40 a.m. Thursday, Feb. 7, on the The Old Road at Weldon Canyon Road, the same location that was closed for a time on Wednesday morning, according to the California Highway Patrol. As of about 7 a.m., the southbound lanes had been reopened, but the northbound lanes remained blocked, the CHP reported. A frost advisory was scheduled to be in effect in the San Fernando and San Gabriel valleys until 9 Thursday morning. Temperatures around daybreak were reported at 35 degrees in Chatsworth, 26 degrees in Lancaster, and 28 degrees in Palmdale.